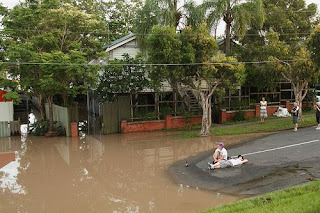 One of the guys I know, Mark, who was directly affected by the Brisbane floods, took a series of professional photos of the flooding event from his perspective. 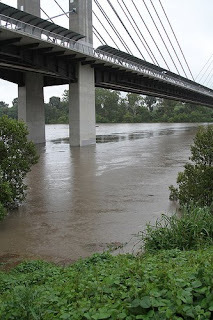 Living in the Fairfield area, he had direct access to the river and the subsequent inundation around him. If you click here you can get to his flickr collection of the full suite of images. 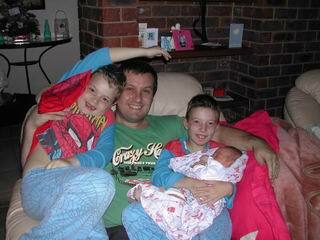 Looking at Mark's recollections on Facebook, it all began with the movies. He outlined that he was thinking about going to the movies at Southbank, but then thought better of it. Someone suggested he should go see "Waterworld". How appropriate. Instead he went out and about and started to document visually what he saw. The river was angry that day, and around the University of Queensland, you began to get an idea of what the next few days were likely to bring if the river didn't recede. As he wrote on Wednesday, "The water rose very quickly on day 2. 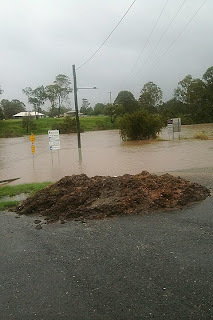 After helping some friends move a few things to higher ground, I did a tour around the local area." Returning home, he had no power. Must have been hard for an IT guru but the good fortune of not having water in your home was probably worth the inconvenience. These shots from around the area now provide examples of some of what he saw. 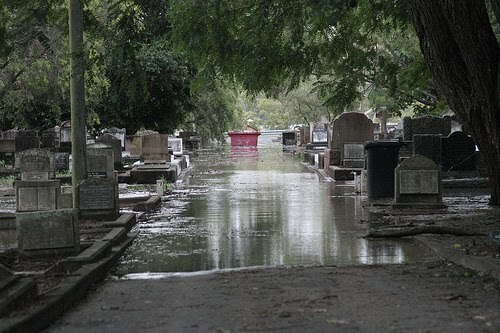 As he commented about Dutton Park Cemetry, "Floods have no respect for the dead. Or the living. :)"
On Thursday, day 3 Mark was out around 4am at the time of the flood peak. He commented, "I went down to have a look - nobody else was about and it was incredibly eerie." This small selection reflects this. Note how by this time, the rain had stopped and at the peak it was a clear, warm morning. 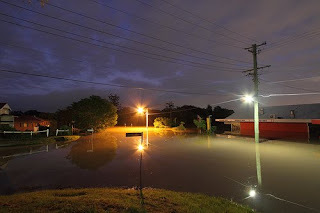 Flood peak at 4am, corner of Ashby Street and Cross Street, Fairfield. After the peak, watching as the water slowly recedes. Again, if you get a chance, have a look at Mark's full group collection of the floods on flickr to see both his and many other's images. 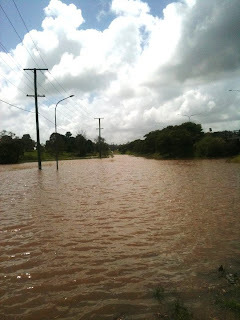 Please, if you can, I urge you to donate to the Queensland Flood Relief on the Queensland government website. Click Here for the Google Map Reference for this post (Fairfield). All Images Courtesy Mark Cocquio. 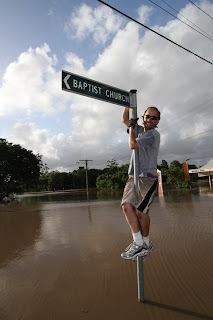 One of my good friends, Kev, had an interesting personal experience as the floods hit over the past week. On Monday, as the deluge continued, he was in the city as it was recommended that businesses be evacuated. 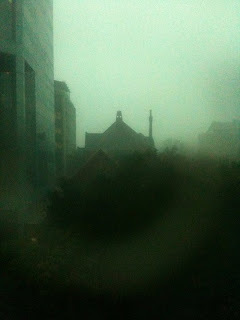 Looking out the window, he had previously had this incredible view of the church across the road through the full impact of one of the storms. He quite rightly decided to get out of the city early. As he had caught the train into work, the train was the option to get out. As he recounted on his Facebook page: "I just don't want to be sleeping under the Storey Bridge tonight mate.... It's bloody hellish down here". 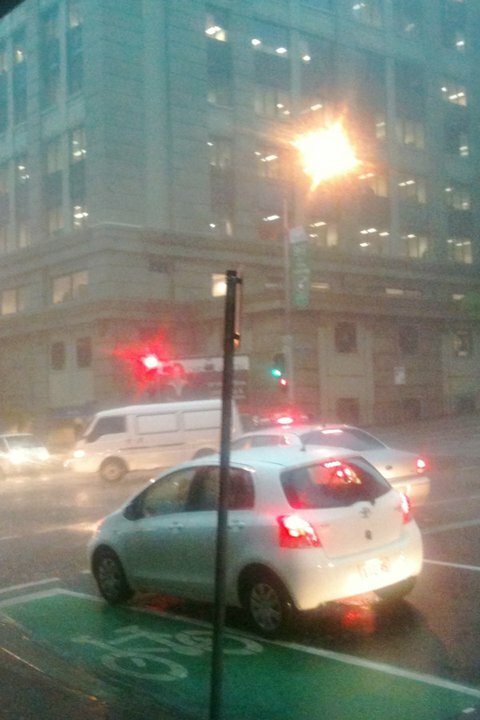 Suffice to say that the trip to the train that night was a drenched one. 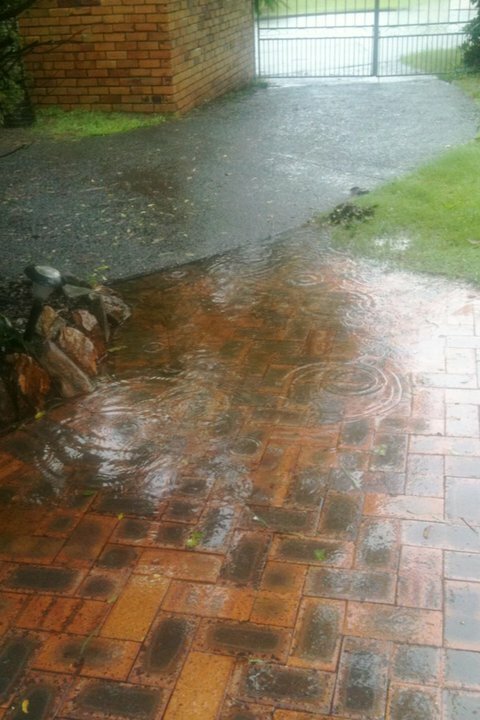 This also provides some indication of the amount of rain that fell in the region, and that had begun on the weekend. Over the Wivenhoe Dam area, several 100mm of rain fell in a few short days. On Tuesday, his place of work sent out the company wide e-mail telling people that the building would be closed, and urging people to leave the city. On returning home, Kev took a number of shots around home and his local area near the Logan River, which had also flooded. Here, you can see the backyard of his house, as he mentioned, "It began to create a new pool". Going down the street, he took shots of the River from the bottom of his street, and also the street signs at the local boat ramp. A day later, and you get the full impact of how much the River had risen in just that one day. Kev was fortunate in other than the impact of lots of rain onto his house, the flood waters didn't rise up to the levels that his house itself was flooded. 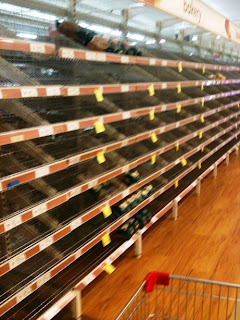 Hi did, however, experience something that many Queenslanders have experienced this past week on a visit to the Supermarket. Empty Shelves! If you have a similar story you would like to share, let me know and I will attempt to post it to this Blog. After all, we All still Love Brisbane! Click Here for the Google Map Reference for this post (Logan River). 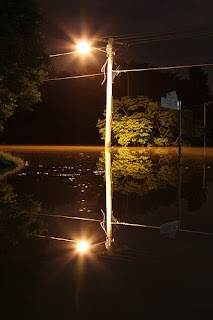 I feel its appropriate to reflect on the Flooding from a personal perspective. As I have said, I was fortunate in both my personal and work life to have not been directly affected by the floods. I know many, however, who have. I will attempt to record some of their stories on this blog, and if you have a story you wish to share, just drop me a line. From my own perspective, after the main flood peak on Thursday, I went to my workplace to see if there was any cleanup required. 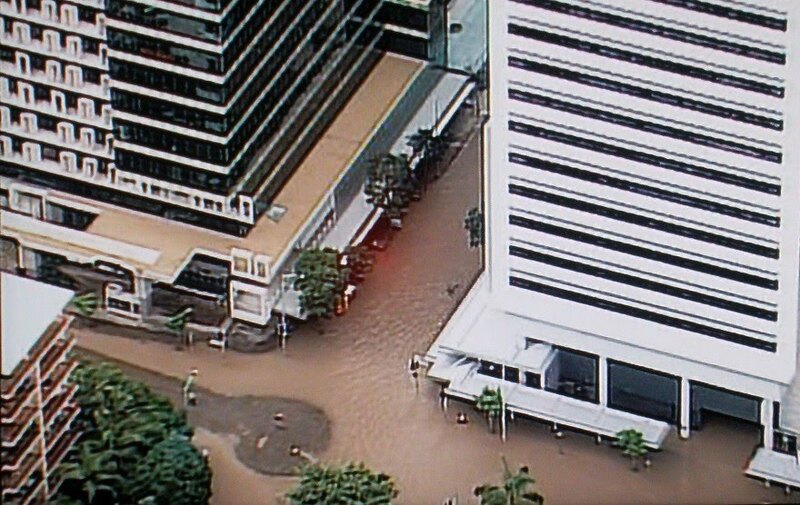 Our offices had been sandbagged in Eagle Farm, but fortunately the drainage system in the area held and no water came into the office park. 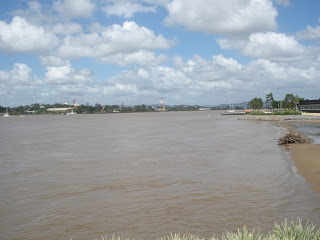 Once we were assured things were ok we went to have a look at the river from Hamilton. At the actual riverside, the river was fast flowing and full of debris. The ever present silt and dark brown cover meant visibility in the water was non existent. Someone had obviously been on the shoreline and attempted to clean up some of the debris, creating this small pile. 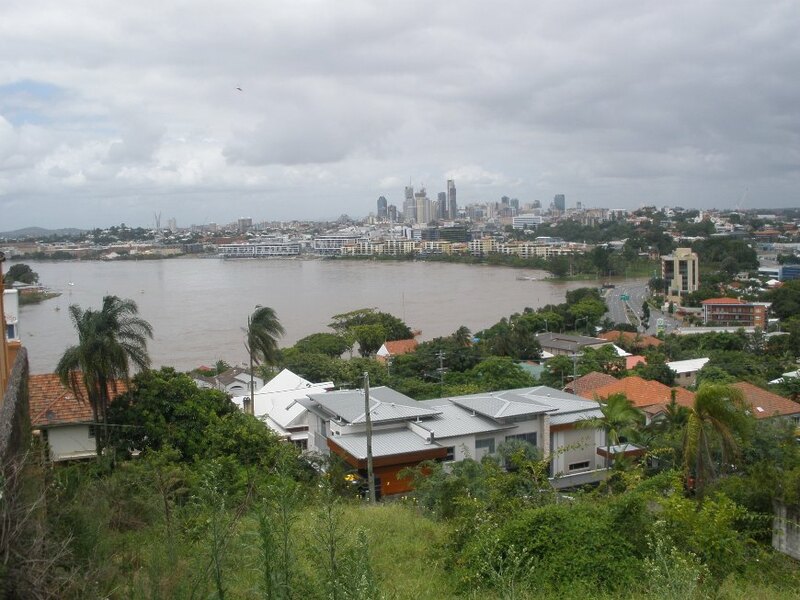 From Hamilton Hill, and below, the streets around Hamilton and Albion had localised flooding. A common site around Brisbane this week has been "tinnies" on the roadways. In some flooded areas either these, jetskis or canoes have been the only method of getting into the areas. Sandbags are also another common site. On returning home, I was again greeted by details of the flooding throughout the city, but in particular within the City itself. Areas where I used to walk were now well underwater. City intersections covered in the slick mud will be the order of the day as the River water recedes. There is a large excavation area on Mary Street, which became a 30 meter deep pool. The images speak for themselves. 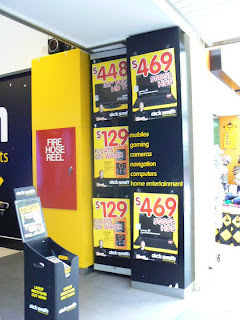 Click Here for the Google Map Reference for this post (Hamilton). 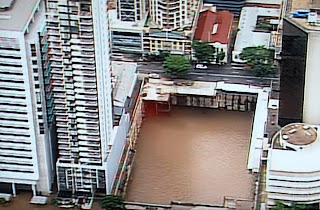 Over the past few days, we've seen lots of images of areas underwater in Brisbane. 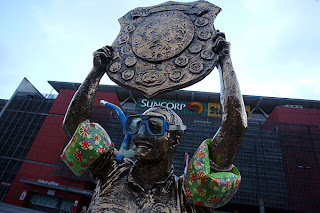 One which has struck me is seeing Suncorp Stadium flooded with brown, murky water. This morning, they are showing that at least the water is receding, however, now there is a carpet of mud over the playing surface. On the first day of the floods there were reports of fire in the stadium, though I believe this was confined to an electrical substation which hadn't been able to have been switched off. 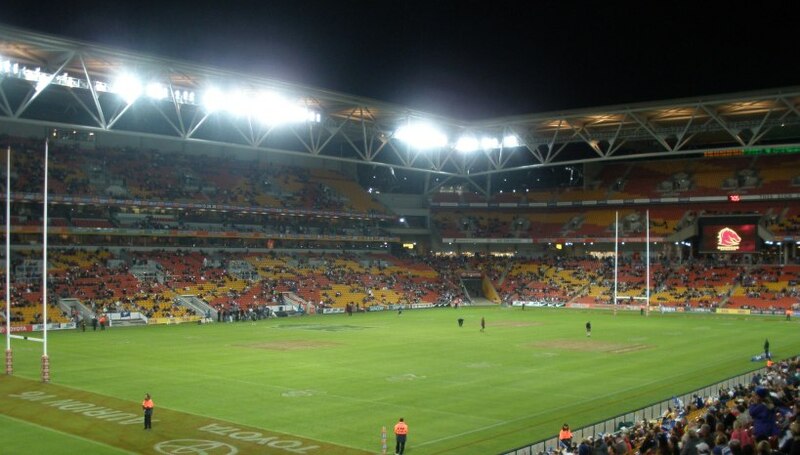 This stadium is the home of Rugby League in Brisbane. To give you some idea of what it looks like in its "natural state", I had the good fortune to attend a game there last year. The lush, green turf shown here will now need to be relaid in preparation for this year's season, although they're now not sure whether that will be achievable. We shall see. 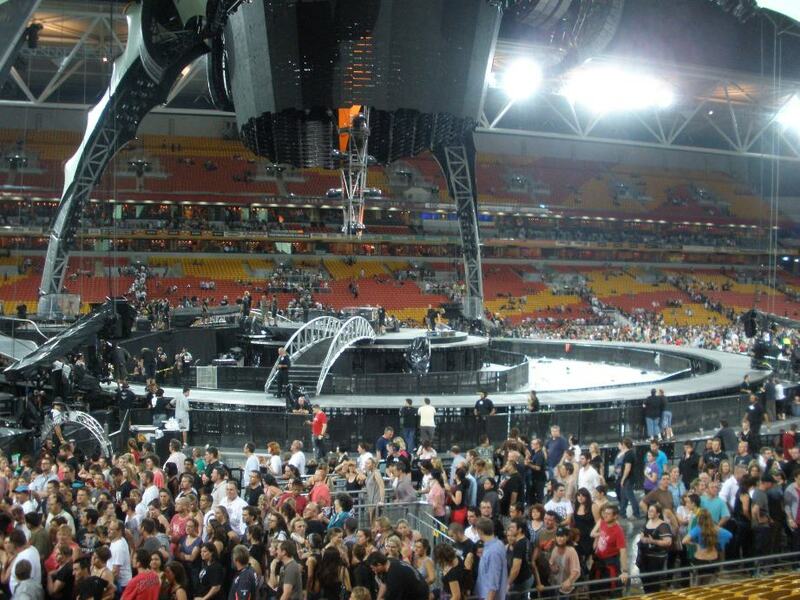 The stadium also has seen it's fair share of large scale international concerts. These have included Robbie Williams, Andre Rieu, U2, and Bon Jovi. The last two were as recent as December last year. 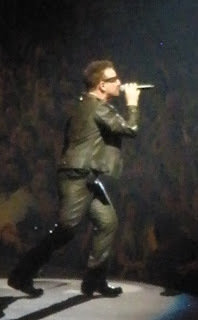 What would Bono think of the stadium where he performed just last month? U2 performed an amazing show, with a strong collection of their hit songs and recent album. The stadium provides an intimate and close up view to these international artists, so has proven itself an excellent venue both close to the city and easily accessible. 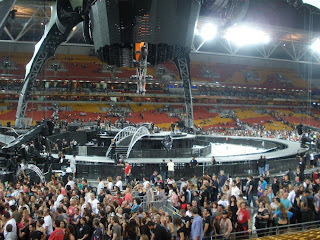 I was fortunate enough to attend the U2 show, and here is another shot which shows some of the stadium from the inside in concert mode. So now the cleanup begins. 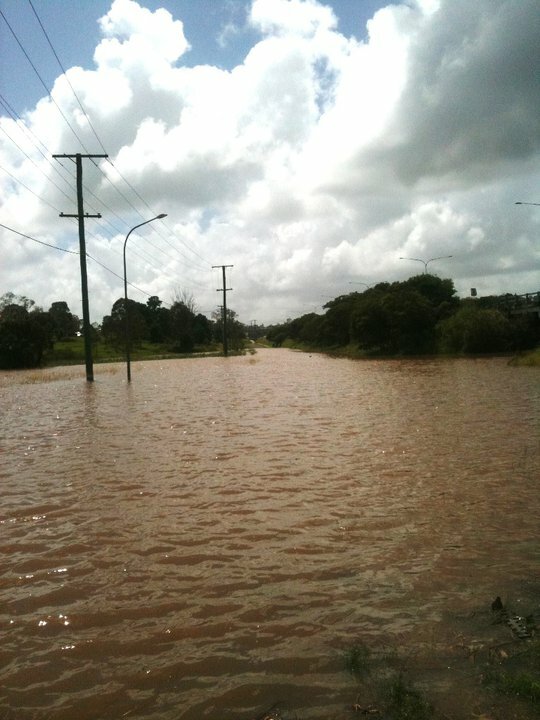 Please, if you can, I urge you to donate to the Queensland Flood Relief on the Queensland government website. I awoke this morning well aware of the likely consequences of the rising Brisbane River, like everyone here. The morning's media reports showed a lot of the impact. With their courtesy, here are some of the images being shown on morning television here. 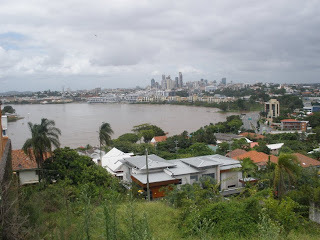 The image above shows the South Bank Parklands, and in particular Streets Beach which many tourists would know. Now, its a dirty, murky pool. All around the precinct is underwater. GOMA, one of my favourite places in Brisbane, looks to be submerged. 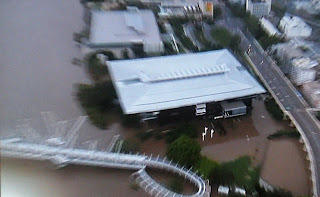 Similarly, another relatively new tourist icon, the Wheel of Brisbane, is also underwater. 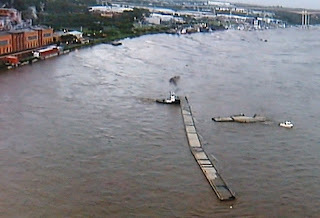 Another amazing image which greeted me was sections of the Brisbane Riverwalk breaking free and floating down the river. The tug boat operators did a magnificent job in ensuring this massive slab of concrete, weighing close to 100 tons, didn't hit any of the other infrastructure on the river. This walkway conneted the Brisbane city area around to New Farm. Having walked and run on this walkway many times, its sad to think that this is now gone. 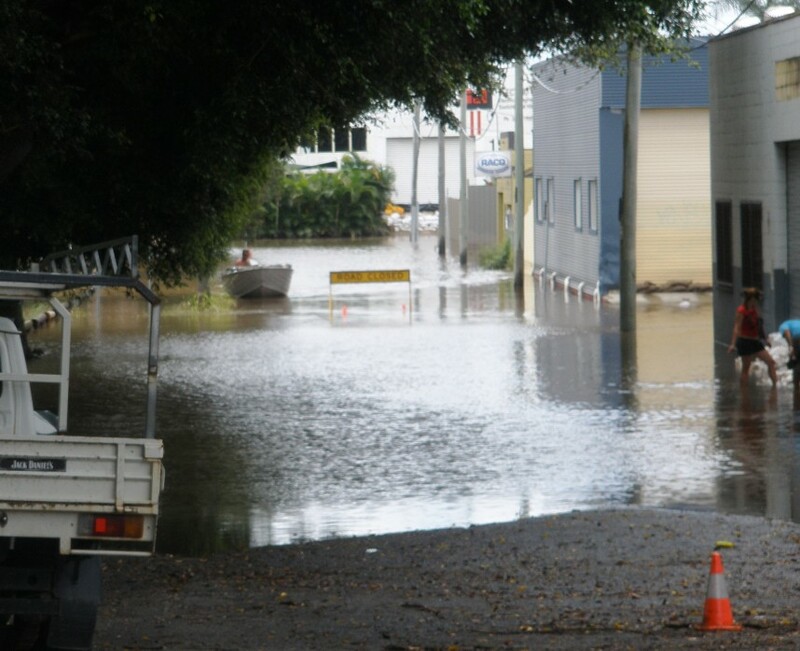 Across the city, various parts that people who have visited may know well have been flooded. 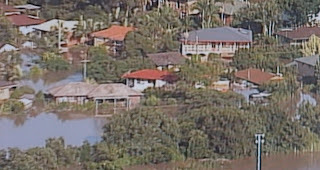 As these next few shots show, the Albion Park Paceway is underwater, as is the Breakfast Creek Hotel, and the Brisbane Tennis Centre at Tennyson. While it is easy to show icons and the impact to our Tourist Industry, we must also consider the impact to our local homes and businesses, which truly bring home the tragedy of what has occurred here. Drift, a restaurant on the river at Milton is totally underwater. This business can be rebuilt, but will need to be done from scratch. 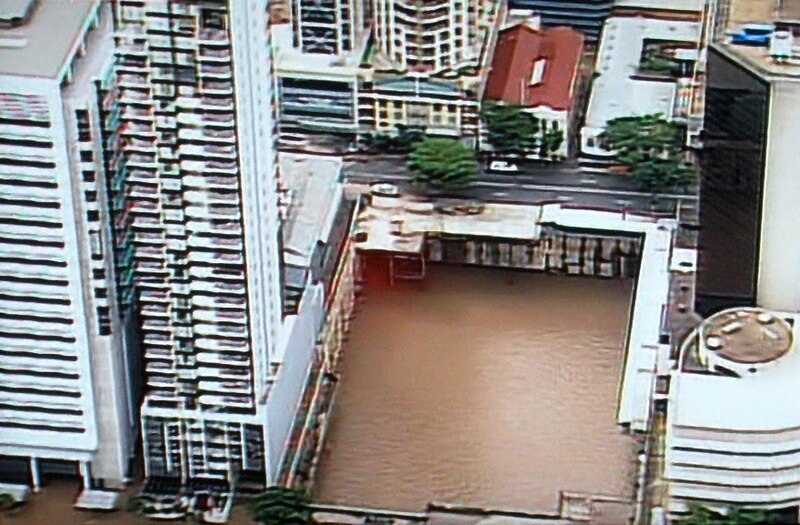 Finally, this shot from Fairfield shows the scope of the impact to my fellow Brisbaneites. Houses are totally underwater, where only the roofs are showing. My heart goes out to these residents, but thankfully, despite the material damage, as long as people and families are together and safe this will allow us to clean up this mess once the waters recede. 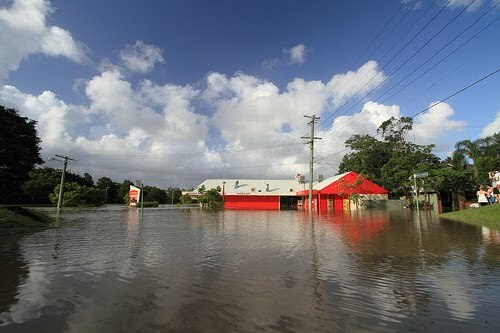 The extent of these floods not only here in Brisbane, but throughout Queensland and now Northern New South Wales is massive. I haven't run an update post to this Blog for a few years now, however, this unprecendented event in Brisbane has made me get back to the site and post this unfortunate update. By now, many of you may have seen the devastation of flooding which has been experienced throughout the State of Queensland here in Australia. There are various sites, like the ABC, Yahoo7, NineMSN, Brisbane Times and the Courier Mail which all have pictures, video and information. Tragically, lives have been lost, and many homes destroyed. 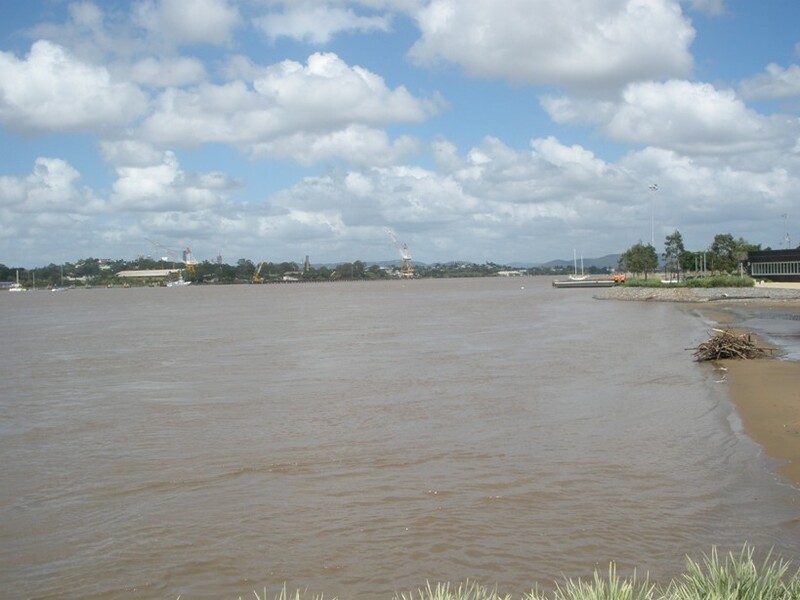 Right now, as I type, the Brisbane River tonight will hit a peak close to the 1974 flood levels, over 5 metres above the base waterline. I personally have not been directly affected, however, I have many friends and colleagues who are. Many of the sites and icons I've posted about on this site are being directly affected. 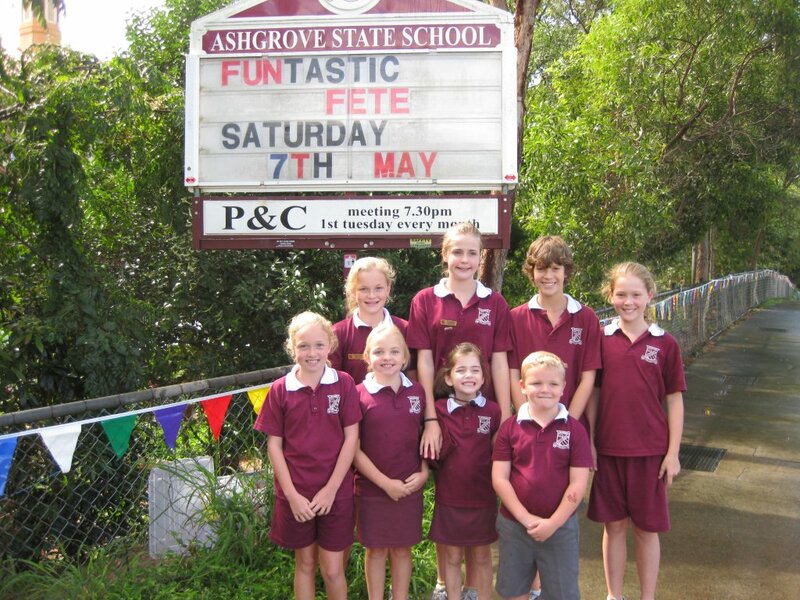 Whilst I know we as Queenslanders will respond and bounce back, it is easy to be dispirited by these events. With our heads held high, the recovery will be quickly started to get us back on track, and back to the great city we know and love. 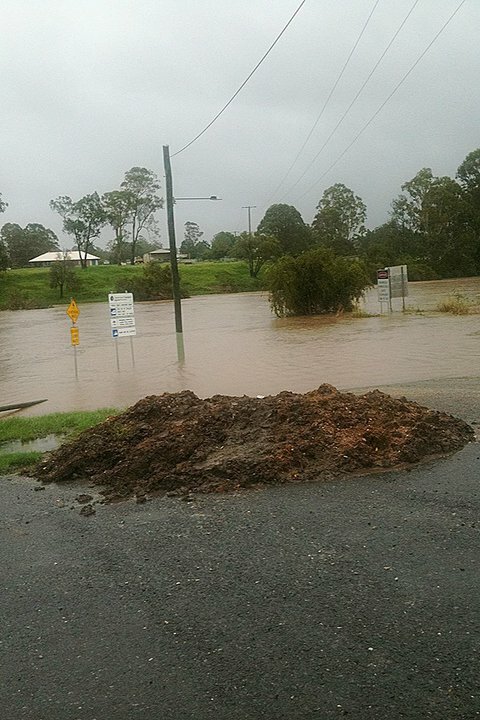 If you can, please donate to the Queensland Flood Relief on the Queensland government website.